You read everywhere (here too) that Shutterstock is one of the best stock photo agencies around, with great photos that cost very little money. But when you go there with the intention of buying only a few images paying as you go, the numbers don't match this description. 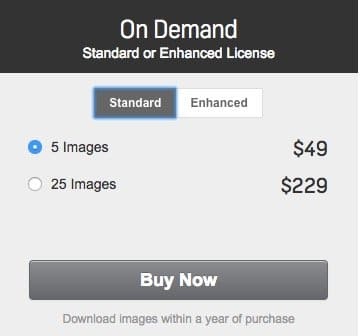 Here's where you wonder: why is Shutterstock so expensive? Well, the truth is Shutterstock has very competitive price points, even for single image purchase. But as this is not the key of their business model, it's only logical for these not to be their most convenient prices. Ready to learn more about Shutterstock pricing and maximise your dollars when buying from them? Keep reading! For more info on this image bank, read our full Shutterstock review. And if you want to save some bucks in your photos, do use our awesome Shutterstock Coupon Code with up to 20% off! One thing you need to know about Shutterstock to understand their pricing is that their business model is based in volume sales. What they aim is for customers to get lots of images constantly, at very low price per unit, making up for price with the quantity of sales. This has been their goal from the start, as they are the company which pioneered in 2003 with stock photo subscriptions that work perfectly for that model: they give you lots of image downloads per month, for a very low flat monthly fee. This is still Shutterstock's star product and the one they enforce and marketise the most, and logically the one offering the lowers per-image rates. 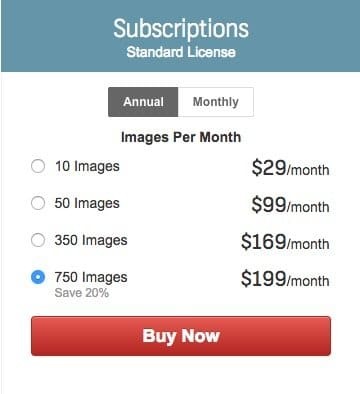 Shutterstock's star product was always the high volume subscription: 750 downloads per month at $249 per month, or $199 monthly with annual plan. This works out at just $0,26/$0,33 per image. Insanely low! Of course this deal only serves those actually needing hundreds of photos all the time. They'd spend a whole lot more buying in traditional stock photo agencies, or even buying on demand in online image banks. So if you need only a few images, but you need them constantly, one of the newer, smaller plans can be a good fit for you, and much less expensive. Learn all about Shutterstock prices here! Subscriptions might be their battle horse, but Shutterstock does not neglect his offer for those buyers looking to get images on demand, paying as they go. For them, they have their image packs. Image packs are prepaid image downloads that you can buy and use whenever you want for one year after purchase date. No periodic fees, no extra charges. Pay now, use whenever (up to one year). There's two sizes of packs: 5 images for $49 (cost per image is $9,80), or 25 images for $229 (cost per image is $9,16). Here too they apply their volume deal, and the more images you buy, the less each of them costs. However it's obvious the rate is much higher than that of subscriptions and the discount over quantity is much less pronounced. Another point to highlight is these prices are still incredibly cheap compared to those of traditional stock photography agencies, Rights Managed licensed photos, and custom photo shoots. See all Shutterstock Prices and Plans here. If you're looking to buy images by the unit, or having more options for on demand buying, you can check these great alternatives to Shutterstock, or simply read our list of agencies to buy photos on demand! But if what you really want is Shutterstock photos, read ahead, we have a little tip for you! As we said before, Shutterstock has subscription plans that you can hire both month to month, or annually. And you can cancel them anytime you want. Since a while, they include low volume plans for 10 or 50 images per month, at only $49 and $125 monthly, respectively. The hack is kind of evident: if you want to buy just a few photos but don't want to pay the on demand rates, you can simply hire a low volume subscription for one month, and cancel it whenever you want. This will let you get more images and at a much lower price. Of course, you need to remember these downloads have an expiration date at the end of the current month of your plan, so you must use them all up before then. If you don't really know if you'll use your photos before the end of the month, this little trick may not be so useful to you. Now you have a better grasp at how Shutterstock prices work, and specially when you compare their prices to those of their competitors and other alternatives in the market, you can easily see Shutterstock is not as expensive as you might have thought from seeing their image pack prices. It is in fact one of the best offers in the stock photo market, and one of the main reasons for their success and popularity. If you add that they have over 100 million images to choose from, it only gets better. Sign up for free at Shutterstock to start downloading great stock photos cheap. And if you really want to maximise your budget, don't forget to redeem our Shutterstock Coupon Code with up to 20% off in your purchase!